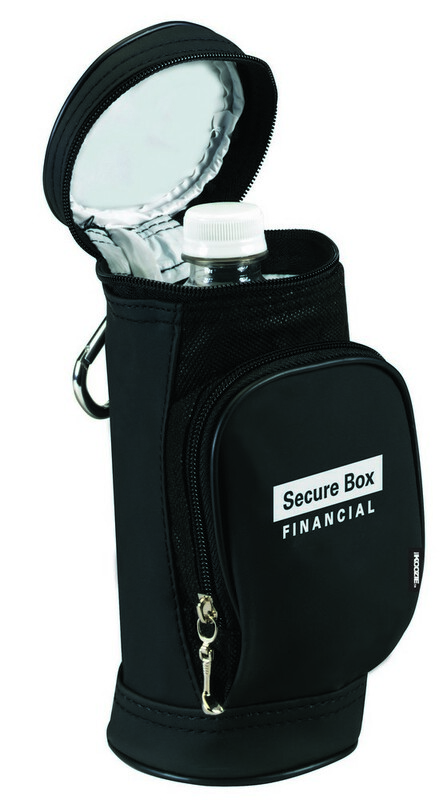 The KOOZIE Golf Bag Water Bottle Cooler features additional zippered pouch for carrying essentials and allows customization for Brand Recognition. Invest in an attention-grabbing promotional product at the next tournament and make sure your list of potential customers grows. KOOZIE Golf Bag Water Bottle Cooler is a functional item that even your regular customers would appreciate. This handy and convenient bottle case can hold a 17 oz. water bottle while keeping the content cool and fresh. It features a sturdy metal carabiner that attaches easily to a golf bag. Zippered front pouch allows storing other accessories like divot repair tools, tees, balls, etc. Get your business logo printed on the front pouch to increase your brand visibility.